"Skaters, dancers, acrobats, singers, musicians and athletes invite you to an evening celebrating the Olympic spirit to the accompaniment of fireworks! Experience the emotions of the great champions. Immerse yourself in a world where pushing beyond the limits means achieving the impossible, and where dreams of victory arouse the passions. Place de la Riponne will be completely transformed to host rare images and videos evoking vivid memories, which will be cleverly intermingled with the artists and athletes on stage. Together they will create a spectacular architectural show." 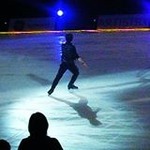 "About Stéphane it says that not only he will skate, he's in charge of all choreographies on ice, presented by 20 students of his skating school in Champéry. Unpublished pictures of the IOC will serve as background for this spectacle with some 400 participants mixing singing, dancing, acrobatics, gymnastics and skating. The story: A young boy who, seeing his idol Alexei Yagudin skating on television, decides to sacrifice everything to reach the top of the podium. In parallel, a young cellist takes the same decision in the hope of becoming a virtuoso and play in the biggest concert halls in the world." So looking forward to the Champions show. Btw,I really enjoy this photo album. And agree with you, Hill, the photos really beautiful, really hope that we can see the full show video. I wonder if somebody from the forum will attend this show? I don't know yet if I can arrange it because of my work. But I hope there will be at least one person there to take video, to "spread his light further" as Reut says (in context with the meeting in Verona): "(…)If Stephane was so generous to share his time and the warmth of his heart, his fans will do the same, "spreading his light" further." This sentence touched me and applies not only to fan-meetings, but to public appearances in shows, too. Or not? It applies to anything "Stephane-realted". Won't be there any TV coverage? The reason looks huge and important enough for that. And maybe IOC will have their cameramen too? I really hope so. P.S. Hope you'll be able to go, jomeku. Unfortunately I for sure won't, as I already plan to go to TEB in Bordeaux a week before that. There MUST be a TV coverage, from French swiss TV! But you can never know (they managed to not even mention Stephane's "Ice Legends" last year. So? IOC seems more likely to film the event. And the imagination to watch it later in the IOC museum will be worth a trip to Lausanne, too (besides the breathtakingly beautiful view over the lake and the mountains you have from there . Thank you, reut, for the links. 'Stéphane Lambiel, expert for emotions', as they write in the article. True! Thank you, reut, for the article … you're extremely fast ! For the magazine 'Illustré' Stéphane and Bastian Baker (swiss singer) met at Malley ice-rink on October 14th "To give 'the bad boys', or heroes, survivors of a wall of fire". Which one of the two is the 'bad boy', actually? Stéphane: "Both of us have the killer instinct. This marks our character. While competing, when it's about being the best, an additional power is needed. I am rather choleric. I want to freak out. With the years, I had to learn to calm down. I have the southern temperament. (The opposite for Bastian). And a sentence about Stéphanes skates. He would not have customized skates. To make them fit he places them in the oven and then puts them on with wet socks. This way they would adjust to his feet. I guess this relates to a larger article inside the magazine. I'll try to find and scan, if possible. Thank you, jomeku. Scans will be so much appreciated! P.S. I think when Stéphane said "On a l’instinct de killer en nous" he wasn't talking about him and Baker, but more about competitive skaters. Oh yes, I guess you're right .